Pictures can be worth a thousand words and when it comes to church design, so can blueprints. 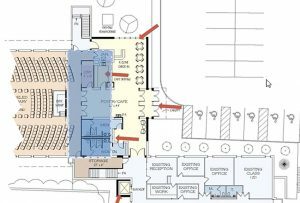 In this post, we discuss small church design renovations making a big difference in a church building and show you the both the before and after blueprints and pictures of how things changed. Bridgetown Church showed its age. 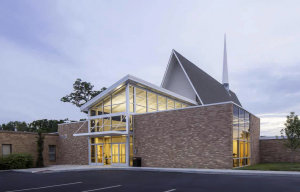 The four-decades-old church design, which was modern and appealing in the 1970s, no longer met the needs of the community. The building had a lot of stained glass; a steep, swooping roof; and a general outdated appearance. In order to attract today’s guests, Bridgetown’s church leaders knew that they needed some changes. They also knew that they needed to be good stewards of their limited funds. They turned to us for help. Here is a blueprint of the old church building, along with some photos illustrating Bridgetown’s issues. As you can see, the entrance to the building was small, dark, and not very appealing. 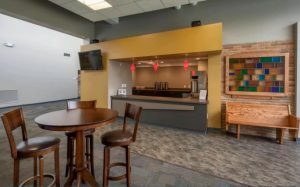 Their lobby was a wide-open space that wasn’t very functional, and they had repurposed an old coat closet to hold a table filled with canisters of coffee and a desk, which didn’t reflect a café theme. All the restrooms were outdated. 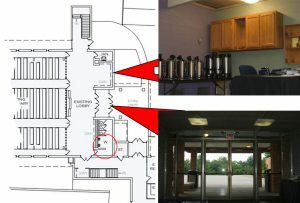 Only a women’s restroom (circled) existed in the front portion of the church building, and any man who couldn’t climb stairs had to use a restroom at the back of the church. The changes we made don’t alter the footprint of the church in a major way, but they make a big difference when it comes to these issues—and more. The blue color is the footprint of the old foyer, and the yellow area shows our additions. 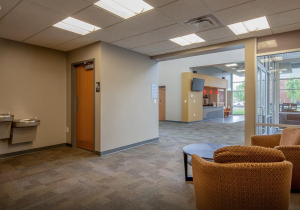 At the front of the building, we included full, handicap-accessible, and modern men’s and women’s restrooms—a necessary element of good hospitality. We also planned a large café with a serving counter, as you can see in this photo. We integrated attractive seating areas around the foyer for conversation that build relationships between guests and attendees. 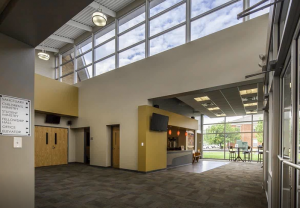 A brighter, more open, and welcoming entry space, which, as you can see here, takes full advantage of natural light, surrounds all of our new church design. We built a check-in zone for children before they go downstairs to children’s church and added a cry room with views of the worship space. We installed an elevator to allow anyone, regardless of mobility issues, to access both floors of Bridgetown Church. Finally, in this image, you can see the outside of Bridgetown Church and how the entire church building shows a modern, welcoming façade. All these small changes transformed the underlying church design into an upgraded appearing and appealing church building. If you would like to talk with us about your church building challenges, contact us today at 800-625-6448 or request@mcknightgroup.com. We also encourage you to sign up for our next i3 webinar, which will give you more ideas and insights for innovation of your existing church building.